Amazon’s just announced a surprising new deal! Now you can subscribe to their “all you can read” service for just $9.99 a month! 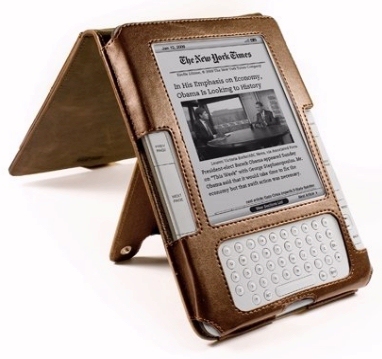 This lets you read any ebook from their special selection of more than 600,000 titles. And Amazon also lets you “sync” your audiobooks with your ebooks, so you can switch over to a hands-free/listening mode whenever you need to — and then switch back to continue reading at that new location in your ebook! 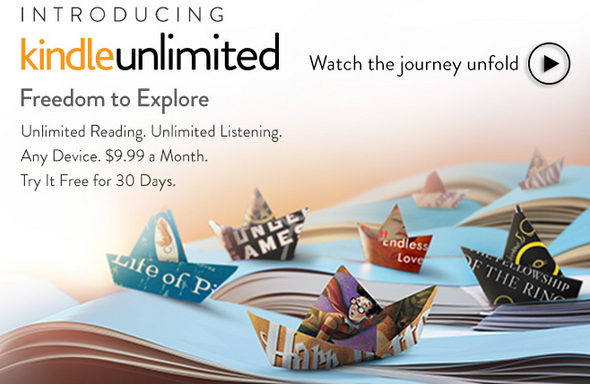 (Amazon calls this “allowing the story to continue even when your eyes are busy.”) It’s a feature that’s been enabled on thousands of the ebooks available in their “Unlimited” subscription service. Just look for this “Whispersync for Voice” logo on the book’s page at Amazon. It’s interesting to speculate about why Amazon’s offering a subscription service. But maybe it’s because people really were shopping around for the cheapest titles. It’s hard for Amazon to make any money if people keep choosing their ebooks from Amazon’s “free” section. With this new program, Amazon will at least get $120 a year from every subscriber. And Kindle owners will get to read as many ebooks as they want!